This article is a short summary of Captain Toad: Treasure Tracker. 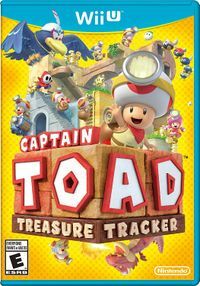 Captain Toad: Treasure Tracker is a 3D puzzle-platforming game released for Wii U in 2014 and developed by Nintendo EAD Tokyo. The game is based on "The Adventures of Captain Toad" stages in Super Mario 3D World, and stars Captain Toad as the main protagonist. A tricky treasure hunt starring... Captain Toad! More than 70 worlds of adventure await, each one a puzzle you can solve. Captain Toad can't jump, but he CAN trounce enemies and switch up the course terrain–in his own unique way, of course. Ready for adventure? Captain Toad stars in his own puzzling quest through maze-like mini-universes–only on Wii U™. Each stage is stacked with tricks, so our stubby hero will have to use his wits to dodge dangers and track those treasures. Survive smoldering volcanoes, hazardous steam engines, haunted houses, and more–all in the name of treasure! That's Captain Toad's mission on life–to hunt juicy valuables like Super Gems and Power Stars across puzzling microcosms of danger and delight. Along the way, he'll have to reclaim stolen goods, not to mention the beloved Toad Brigade member Toadette, who's been nabbed by a greedy bird. This tiny hero will have to waddle, hide, pluck, chuck, and power-up his way through enemy-infested locales like wild west shanties, beautiful towers, and Goomba waterparks–all bursting with goodies to find and secrets to unearth. Point your head-mounted flashlight towards adventure! Gameplay is similar to the Captain Toad levels in Super Mario 3D World. As Captain Toad cannot jump, stages are generally smaller and more puzzle-oriented than regular Mario games, though the main goal, like in previous 3D Super Mario titles, is to reach the Power Star at the end. Instead of jumping, Captain Toad can pull on Pluck Plants and toss items such as vegetables to attack similar to Super Mario Bros. 2. Captain Toad can also pull up items, and can pull on levers to progress further. Also within every stage are three Super Gems to collect, and every stage also has a bonus objective that can be completed, which is only revealed once the stage is completed. By scanning a Toad amiibo before starting a stage, the player can access a hide-and-seek game in which the player must find an 8-bit stylized Toad sprite in every stage. Using any other amiibo gives the player additional 1-Up Mushrooms. 1.1 March 19, 2015 Adds amiibo support. Captain Toad: Treasure Tracker Nintendo Switch WW: July 13, 2018 A direct port of the game for Nintendo Switch. This version includes new content based on Super Mario Odyssey and a second player assist mode. Captain Toad: Treasure Tracker Nintendo 3DS WW: July 13, 2018 A port of the game released for Nintendo 3DS. This version includes new content based on Super Mario Odyssey, stereoscopic visuals, and bottom screen functionality similar to the Wii U version. ↑ 1.0 1.1 Nintendo Direct 3.8.2018. Nintendo (YouTube; March 8, 2018). Retrieved March 8, 2018. ↑ 2.0 2.1 進め!キノピオ隊長 [Nintendo Direct 2018.3.9]. Nintendo 公式チャンネル (YouTube; March 8, 2018). Retrieved March 8, 2018. ↑ 3.0 3.1 Nintendo Direct - 08.03.2018. Nintendo UK (YouTube; March 8, 2018). Retrieved March 8, 2018. ↑ 4.0 4.1 "#CaptainToad Treasure Tracker explores #NintendoSwitch on 13/07! This adventure will include new levels from #SuperMarioOdyssey too! 🍄 A Nintendo #3DS version also launches the same day, with touch-screen controls & stereoscopic 3D visuals! #NintendoDirect" Nintendo AU NZ on Twitter (March 8, 2018. Retrieved March 8, 2018. This page was last edited on 13 October 2018, at 17:42.